Departure time: 9:15h. Frequency: From 01 April to 31 October. Days: Monday, Thursday and Saturday. Duration: 8 hours approx. Departure from: JULIÀ TRAVEL OFFICE: San Nicolás 15 (next to Plaza de Ramales). Conditions: Book at least 24 h. advance. Cancellation fee: 100% for less than 72 hours notice or no-shows. Languages​​: Spanish, English. Lunch is not included... However you can choose any of the options listed below, referring to the required supplement on the price fact sheet. Tourist Lunch: Vegetable stew; Veal loin with green beans and French fried potatoes and Vanilla ice cream with fruit salad (Drinks are not included). Gastronomic Lunch: Appetizers and Castilian Tapas; Roasted Lamb with vegetables; Truffle cake with ice cream and Wine of the house, mineral water and coffee. 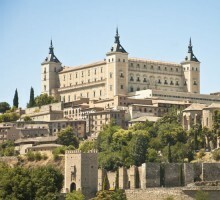 Located 70 km away from Madrid is Toledo, a beautiful city-museum declared World Heritage Site by UNESCO. It is one of the oldest towns in Europe and has a great artistic beauty and buildings from almost all periods in history (Arabian, Gothic, Mudéjar, Renaissance and Baroque style). Toledo is called the “City of the Three Cultures”, since Christians, Muslims and Jews lived together. In the XVI century, it was also home to the great painter El Greco. It is known as The Mosque of El Cristo de la Luz, The old Bib-al-Mardum Mosque, or Valmardón Mosque. However the history of this building as a mosque ended in 1186, true reflection of Caliphic architecture. The visit continues with tour to the inside of the Cathedral. Its architecture shows all the stages of Spanish Gothic, and the inside of the building contains a large number of artworks (stained glass, choir, main altar, different chapels, El Greco paintings, etc.). Following that we will see the Church of St. Tomé, home to ‘El Entierro del señor de Orgaz’ El Greco’s masterpiece; and the Synagogue of Sta. María la Blanca. 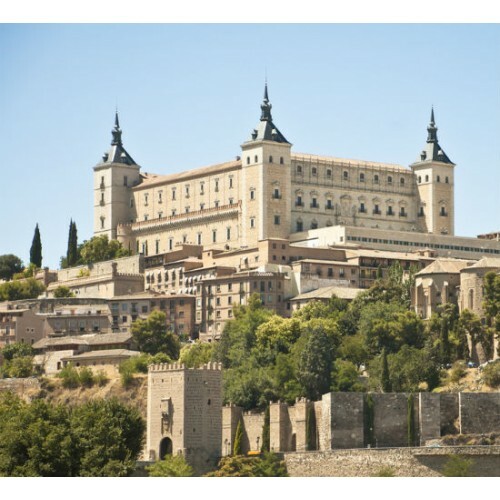 The tour will finish with a demonstration of the millenary Damascene technique (incrustation of precious metals on steel) and a trip to Toledo’s viewpoint, to enjoy its panoramic view. Once we have enjoyed ourselves in Toledo, we will head towards to Madrid around 14.30h, but we will stop in Bargas on our way. There we will visit Finca Loranque and its wine cellars and we will also have the chance to taste some of its wines. Entrance fee to Cathedral, Church of St. Tome, Synagogue and Mosque. Commented tasting of 3 wines and an appetizer. Lunch or other services not specified above.